^ a b "Powell's to move Tech Store". Portland Business Journal. March 4, 2010. Retrieved 2010-12-07. ^ a b "Powell's Books on Burnside". Powell's City of Books. Retrieved 2009-03-12. ^ Frances Cha (July 30, 2014). "World's coolest bookstores". CNN. Retrieved 2016-06-18. ^ Bennett, Sam (November 13, 2008). "New design for Powell's Books features an art cube". Daily Journal of Commerce. Retrieved 2016-06-18. ^ Gunderson, Laura (January 22, 2008). "Powell's plans expansion in two years". The Oregonian. Retrieved 2007-01-24. ^ Nawotka, Edward (January 23, 2008). "Powell's to Expand Flagship in 2010, Absorb Technical Store". Publishers Weekly. Archived from the original on February 9, 2008. Retrieved 2007-01-24. ^ Giegerich, Andy (October 26, 2010). "Powell's Books buys Anne Rice collection". Portland Business Journal. Retrieved 2010-12-07. ^ "Discover more than 3 million Google eBooks from your choice of booksellers and devices". Official blog. Google. December 6, 2010. Retrieved 2010-12-06. ^ Agrawal, Rocky (July 4, 2011). "Google Offers Versus Groupon: The Portland Throwdown". TechCrunch. Retrieved 2011-07-11. ^ "The Espresso Book Machine Arrives at Powell's Books" (PDF). Press release. OnDemandBooks.com. May 4, 2012. Retrieved 2012-05-14. ^ Hallett, Alison (May 4, 2012). "More on Powells' New Espresso Book Machine". The Portland Mercury. Retrieved 2014-06-06. 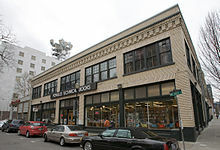 ^ "Owner, new CEO of Powell's Books see strength in brick and mortar". The Oregonian/OregonLive. 25 April 2013. ^ Bosman, Julie (February 9, 2011). "Powell's Books Announces Layoffs". The New York Times Arts Beat blog. Retrieved 2011-02-09. ^ "Oregon Secretary Of State". secure.sos.state.or.us. Retrieved 2017-01-19. ^ "Oregon Business Tax Increase, Measure 97 (2016) - Ballotpedia". Retrieved 2017-01-19. ^ "Online Voters' Pamphlet | Oregon Secretary of State". sos.oregon.gov. Retrieved 2017-01-19. ^ Marum, Anna (January 6, 2016) [print-edition date January 8, p. C1]. "Powell's Books to expand Hawthorne location". The Oregonian. Retrieved 2016-02-01.